Hope you enjoy making & eating this simple egg curry as much as I did! 1.) Place the eggs in a deep pan filled with plain water (enough to cover the eggs) and bring the water to a rolling boil. Continue to boil for 12 minutes. 2.) Turn off the flame, transfer the eggs into fresh water at room temperature and when cool enough to handle, peel off the shells carefully. 1.) Heat some oil in a wok or non stick pan and roast the coconut for a couple of minutes before adding the roughly sliced onion and poppy seeds. Toast the ingredients on a slow flame until you get a nice aroma of roasted coconut & the colour changes to pale brown (biscuit colour). 2.) Toss in the bafat powder and garam masala and give the mixture a stir and turn off the flame. Allow to cool. 3.) Once cooled, use a little water to grind the toasted coconut mixture, tamarind, ginger, garlic & salt to taste to a fine paste. 1.) Heat oil for seasoning in a pan and toss in the curry leaves and the finely sliced onion and fry till the onion turns golden brown. 2.) Add the ground masala paste and fry for a couple of minutes on sim. Add water from the mixer jar and additional water if required to arrive at a thick gravy like consistency. Bring the gravy to a full boil. 3.) Add the potatoes and cook on sim for 3-4 minutes till the potatoes are cooked after which you can add the semi slit hard boiled eggs and simmer for a couple of minutes. Add the garam masala powder only if you are using plain chilli powder or bafat powder without the garam masala added to it. The Bafat powder recipe link I have provided above is for Bafat minus the garam masala, hence I have mentioned 1/2 tsp separately. Hi Sherrin, I am your new follower. I can not explain how grateful I am for your recipes. I can follow your recipes with no stress, trusting that the dish would turn out to be very good.You have helped lot of us manglorians who live away from our hometown to savour our traditional recipes.Thank you from the bottom of my heart and God bless you. Thank you so much for those words of appreciation!! I am so happy to know that you enjoy my recipes a lot..you made my day with that comment cuz I saw it first thing in the morning 🙂 Thank you for your love n good wishes – that is all I need!! Stay tuned for more recipes! Have a nice day! 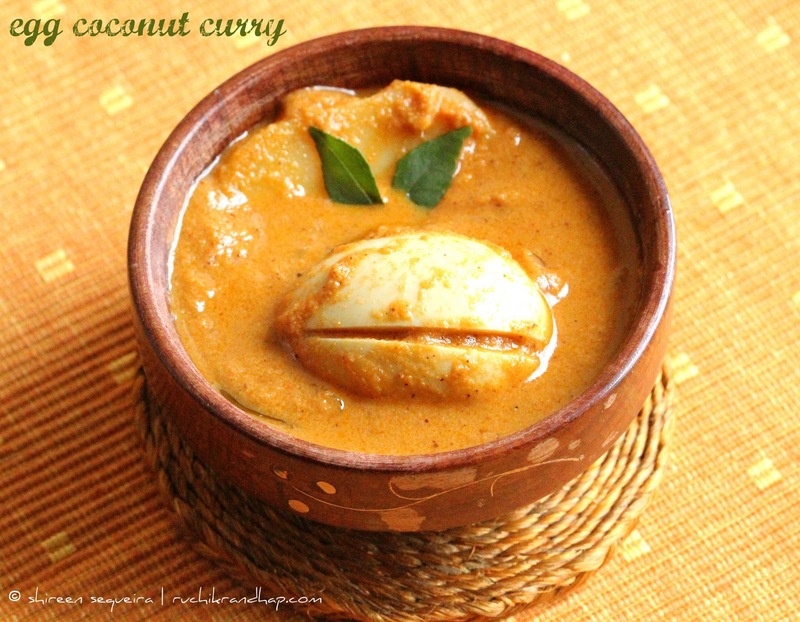 Love your click Shireen… I too make almost similar egg curry, with coconut.. Awesome recipe & beautiful pictures. Super fingerlicking egg curry,looks super rich and delicious. OMG ! Just wish I was there to get a taste of this wonderful curry. Wonderfully prepared. Awesome egg curry, i make it quite often as well shireen. Any alternative for the bafat powder? Cool pics shireen. that looks so yummy shireen…. delicious dear…You have made this perfectly..Will surely give it a try..
@San: So sorry for the delayed response – If you do not have bafat powder you can use a blend of red chilli powder (abt 1 tsp)+ coriander powder (3/4th tsp) + 2 pinches each of cumin powder, pepper powder & turmeric powder. This is an approximation as it is tough to raze down the quantities to a few teaspoons as we make it in bulk. But I think this should work well 🙂 Good luck! Super awesome…I tried it today 11 Aug 2012 and believe me its truly yummmy…color / taste superbbbb!!!! Hi Anita, Thank you so much for your feedback! So glad to know that you liked the curry!! Will try it today. I am from Mangalore but don't know this cusine well. Thanks a ton. Thanks for directing us to the website on how to boil eggs – educational and interesting. @ Anonymous: Happy to hear that you found my post useful. I hope you enjoyed making & eating this dish! I tried this yesterday and it was awesome. 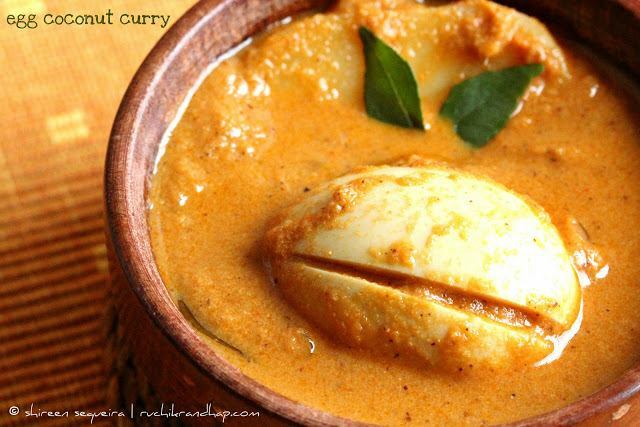 Turned out just great..have bookmarked it as my "go to" egg curry for any occasion. @ Rashmi Mendonza: Thanks for the feedback and sorry for the delay in responding! @ Chhaaya: Thanks for your feedback! So glad to hear that you enjoyed it! Egg curry has always been my all time fav. I tried this receipe yesterday and it tasted good. I am happy I could also do it. Thanks Shireen. Thanks for sharing Shireen!!! Looks so delicious!!!! Tried this today. It was delicious. Thank you Shireen for posting . Cooked it at home, came out awesome. Thanks for the recipe. @ Rani @ Laveena @San D @ Astron : Thanks a ton for your feedback! So glad you liked it! Thanks for the feedback Rohan!